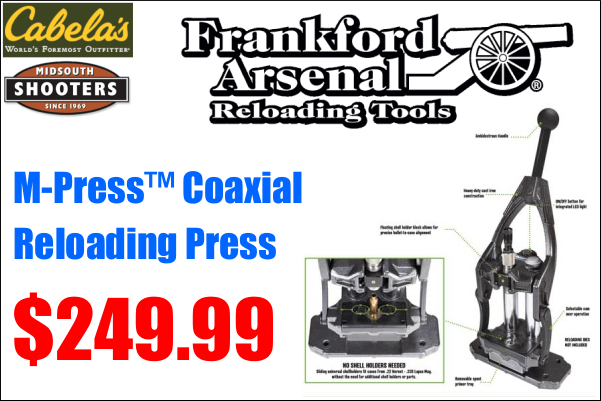 If you were charged with building a scope for F-Class or long range Benchrest, what features would you want? 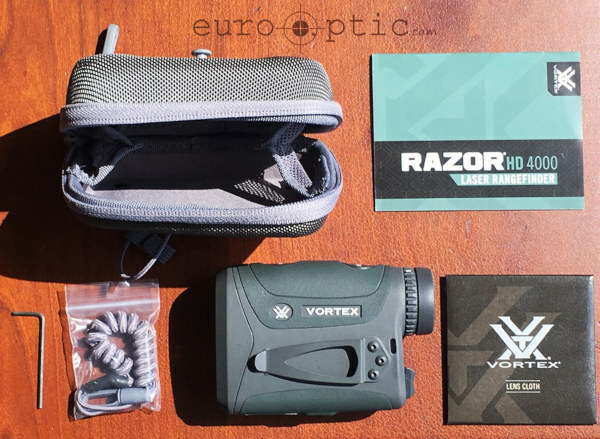 Vortex asked that question, received feedback from many competitors, and then set out to build a new high-magnification, zoom comp scope that would set a new “performance for price” standard. 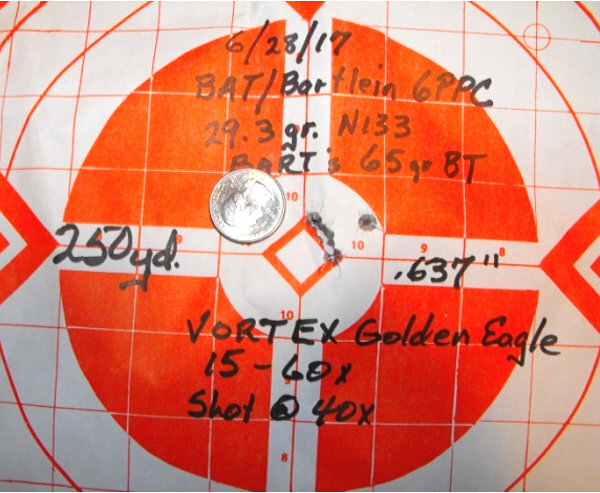 The new Vortex Golden Eagle has features that this shooter really appreciates. 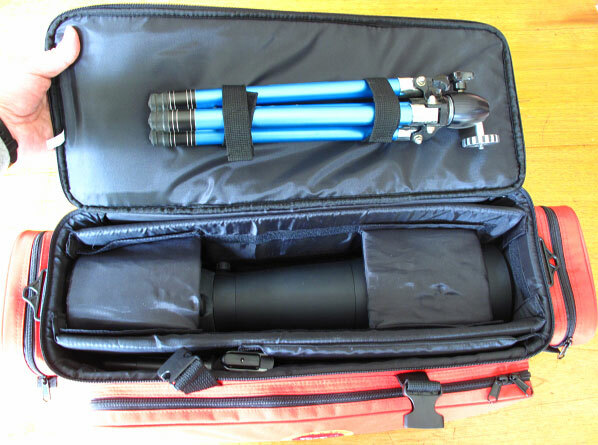 It has a power range of 15x to 60x with a 52mm objective lens. 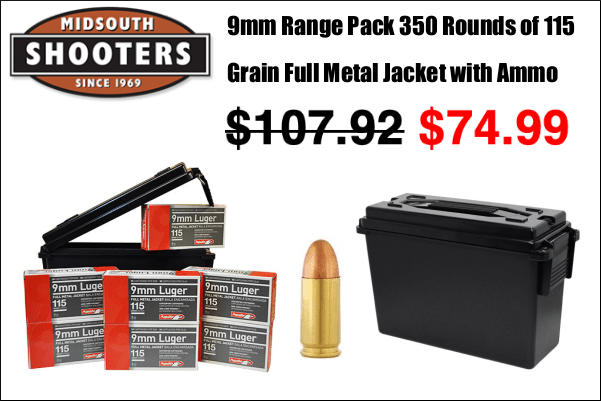 Vortex has attempted to keep the weight as low as possible and the cost reasonable. 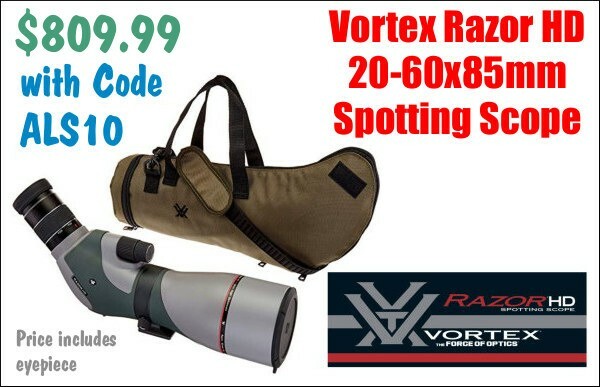 My initial impression is that Vortex spared no expense in developing this scope. 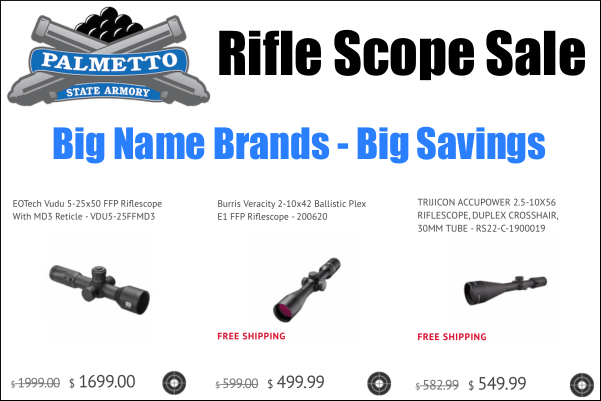 The “street price” for this premium scope is a reasonable $1499.00. 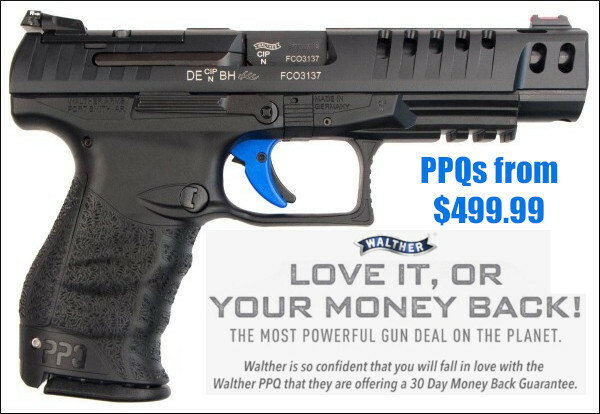 Plus it has Unconditional Lifetime Warranty. 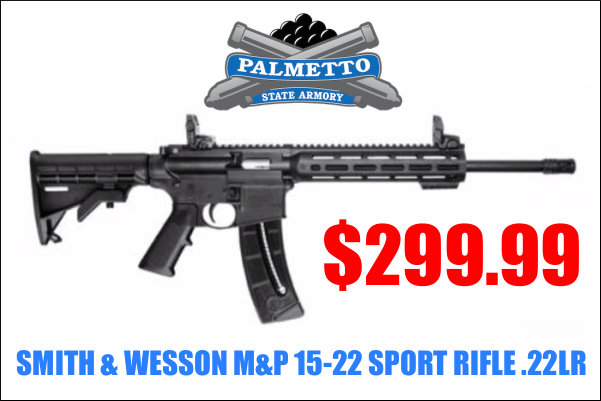 Given its features, performance, and price, I believe that this scope will sell very well. 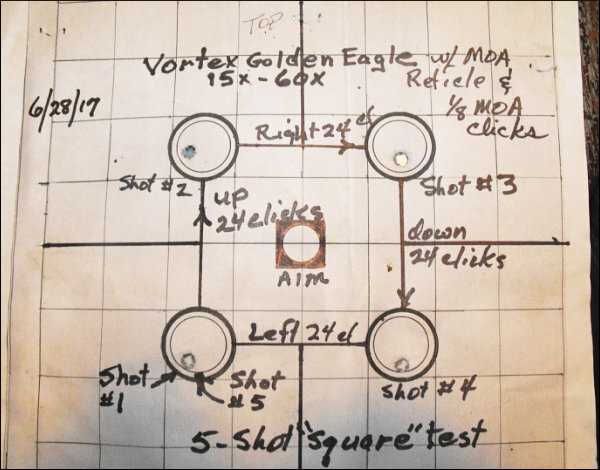 I recently tested a Golden Eagle with the ECR-1 reticle. On this model the Hash Marks subtend 1 MOA at 40X. 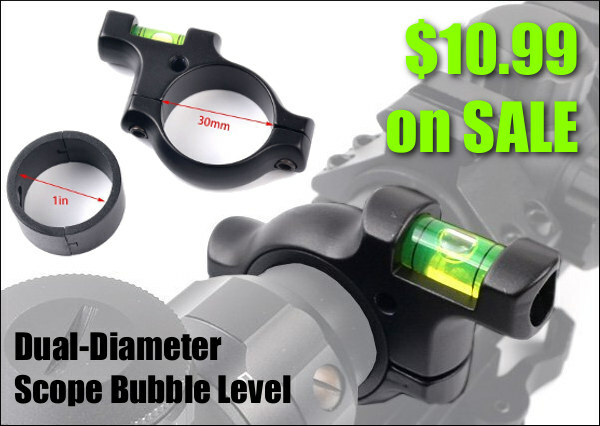 There is also a fine crosshair reticle (SCR-1) available. 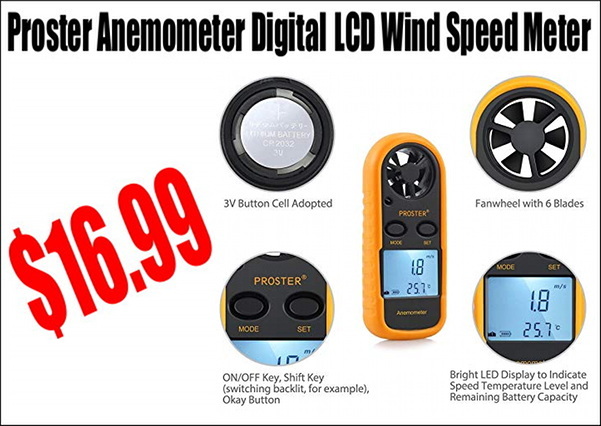 Initial tests with the scope were done on June 28th and I was very impressed with what I saw. With a new scope I always shoot the square (box test) to test tracking and amount of movement. I shot the square today after shooting a 5-shot group at 250 yards (my longest available distance). 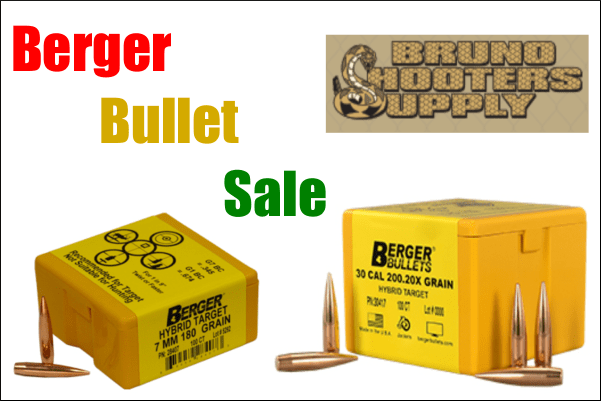 Below is a picture of the box test target that I shot. Yes, shot #5 went through the exact same hole as shot #1. Below is the 250-yard target I shot before doing the box test. 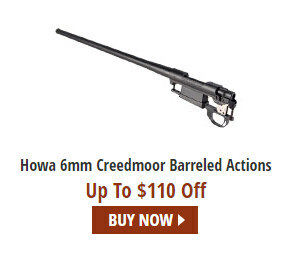 To get to the 100-yard target, I clicked down 14 clicks (1/8th MOA) and the scope was spot on. It is really a pleasure to use instruments that do exactly what they are supposed to do. 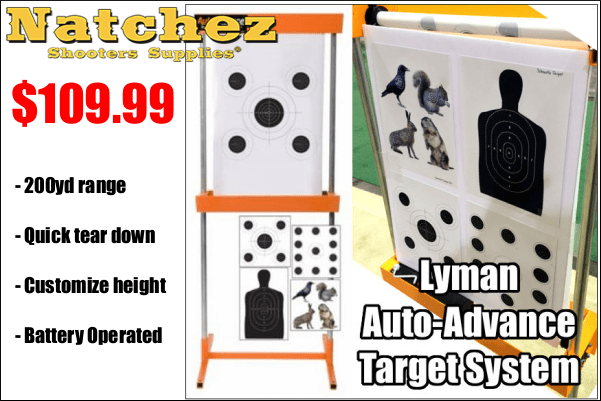 With the Louisiana mirage, I shot this orange/white target at 40X instead of the maximum 60X. 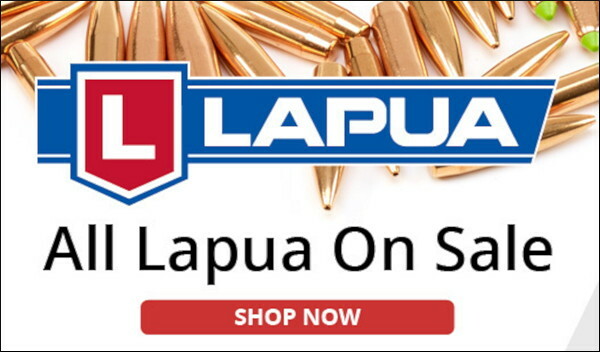 I did not have any problem seeing the 6mm bullet holes at 40X. 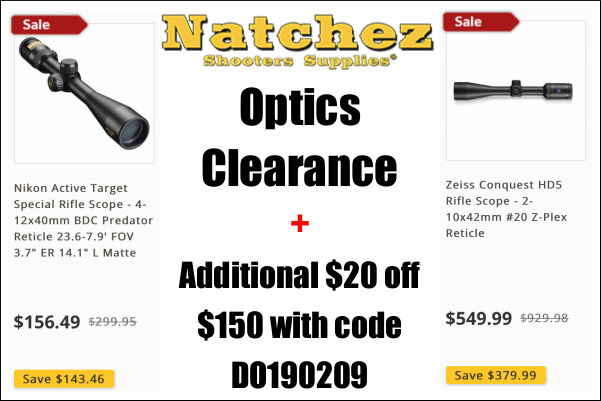 The optics in this scope are to my old eyes are as good as any that I have used (regardless of price). 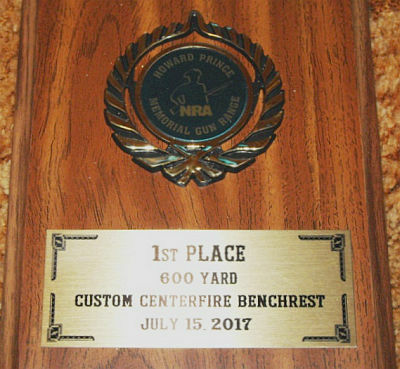 My next use of this scope was at our monthly 600-yard match on July 15th. It was a typical mid-July day in north Louisiana — very hot and humid with light switching winds. The mirage was terrible, but I managed to squeak out a victory with a 188/5X score out of 200/20X possible. 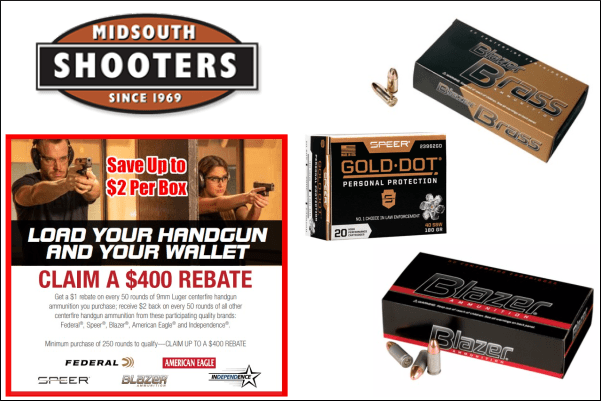 I shot the Golden Eagle at 40X all day and it performed perfectly. 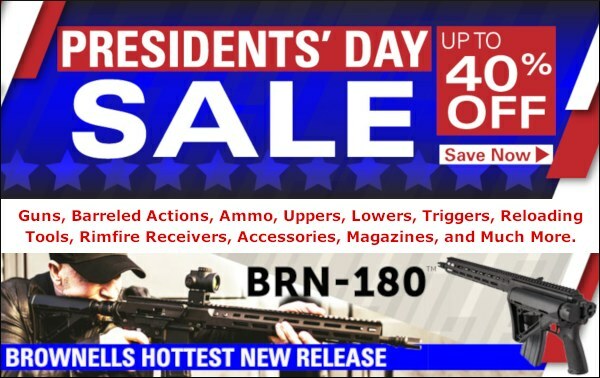 No one could see bullet holes today, even with the high powered premium spotting scopes. 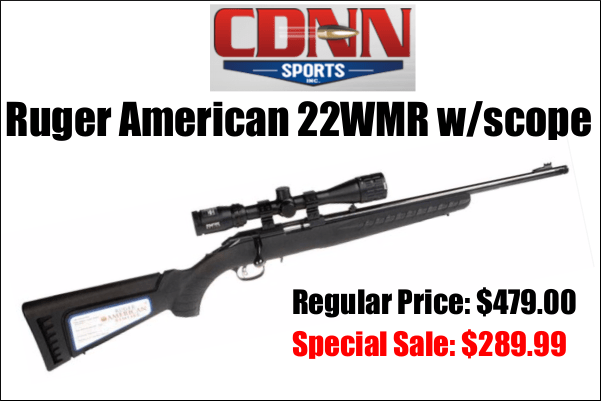 This is a quality scope and it may be a “lucky” scope in that I did not expect a win with a 6mm Dasher barrel with 2500 or more rounds through it. I also tested the Golden Eagle for holding Point of Aim (POA). For this procedure, I used the Hood scope checker (loaned to me by Bart Sauter). 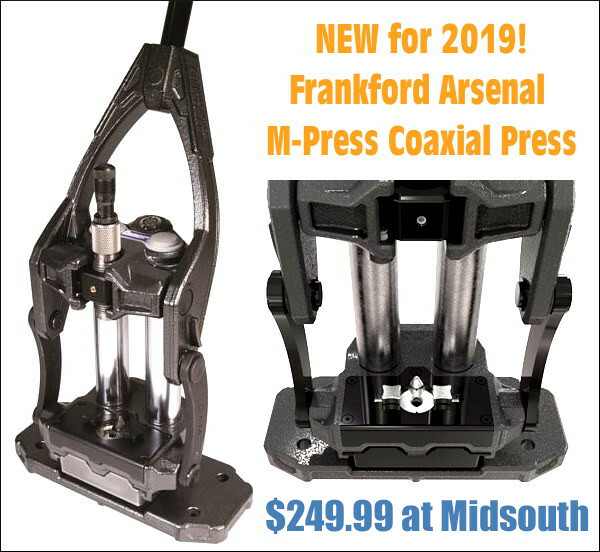 To use this, one mounts two scopes side by side. Ideally one scope has proven its ability to hold POA. Here I used a Valdada 36X BR model as my control scope. It has proven over an 8-year period of time to hold its point of aim. 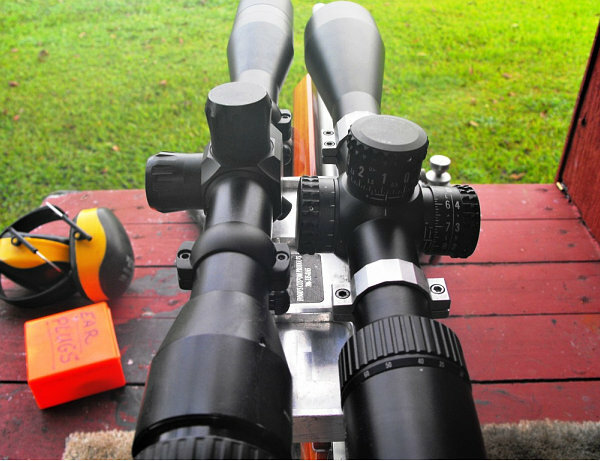 I mounted these scopes on my BAT/Leonard 6mm PPC and adjusted each to the same point on the target. 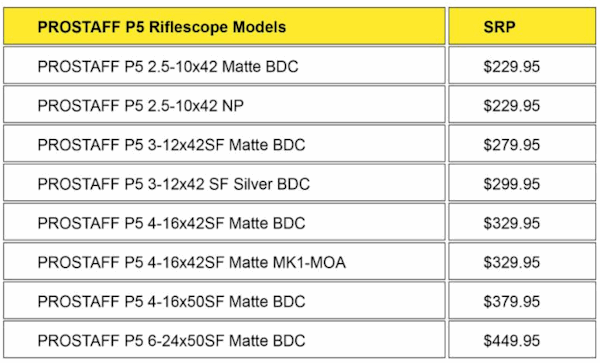 As one can see in the above picture, these are big scopes. After the first shot, I noticed that the reticle dot on the Vortex seemed to be about 1/8th MOA to the right of its original position. I stopped to check for ring slippage (which I had experienced in prior tests). There was no apparent slippage, so I checked the parallax and found that there was some parallax correction needed. This was probably the source of the apparent shift in point of aim, but I cannot be sure of that. I fired three more shots (checking after each) and found no shift. After testing for POA shift, I fired the remaining rounds using different aiming points. 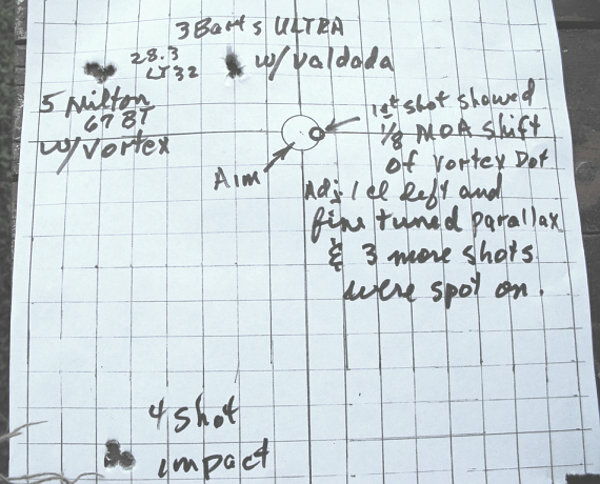 I fired 5 rounds (upper left) using the Vortex and 3 rounds to the right of those using the Valdada scope. 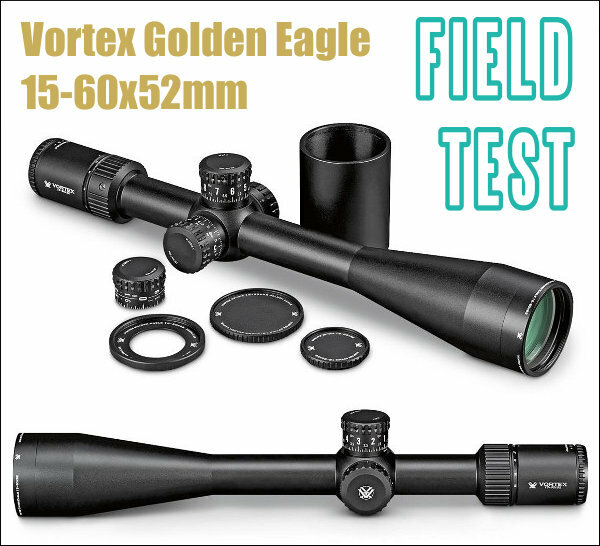 While testing this Vortex Golden Eagle scope, I developed a real fondness for it. 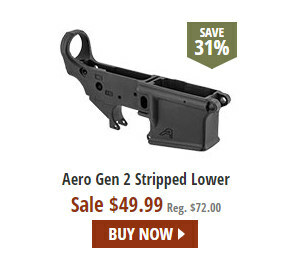 I appreciate its great optics, eye relief and crispness of adjustments. If I thought that this scope did not hold POA, I would use my old Valdada in the 600-yard matches in which I participate. Further testing has shown no tendency to shift point of aim. If I am allowed to keep this scope until the fall, I am sure that I will be able to see 6mm bullet holes in the white at 600 yards. 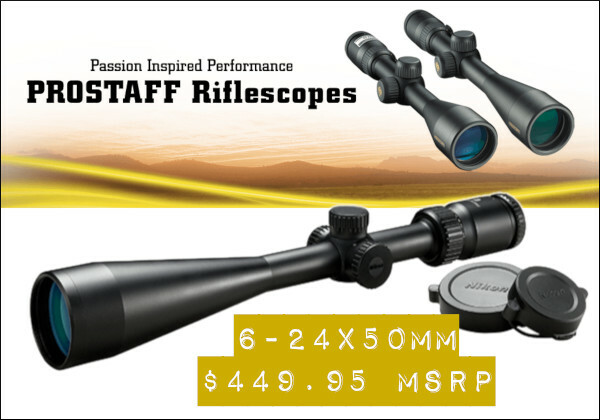 Seeing those 6mm holes is very difficult, but that is my dream for a premium high-powered scope. 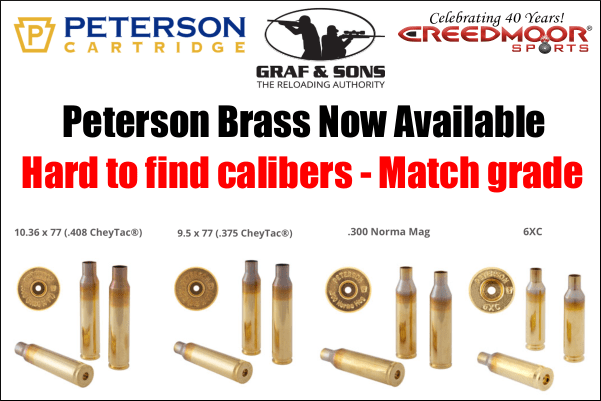 During the summer months in north Louisiana, the air is much too “dirty” to spot small holes at 600 yards. 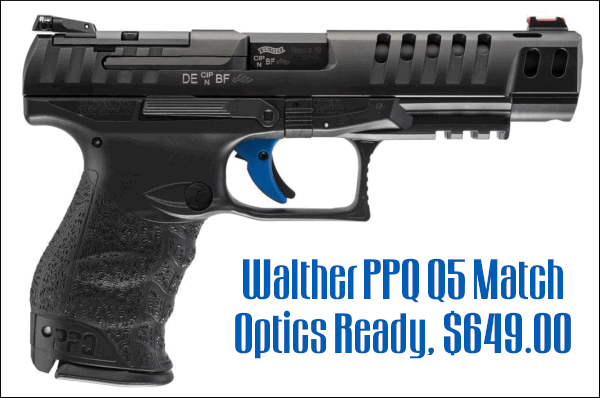 By October, there should be some conditions in which one can use the premium optics to see bullet holes in the white at 600. 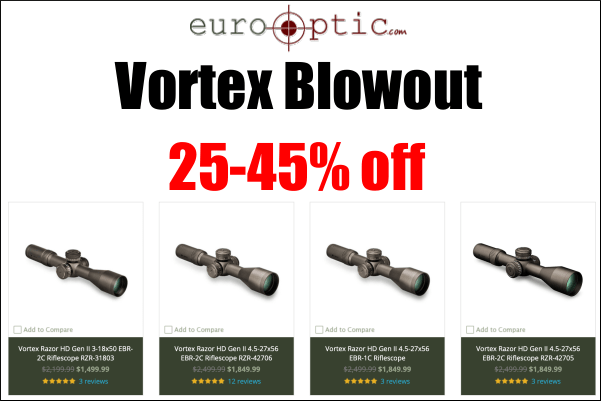 Share the post "Vortex Golden Eagle 15-60x52mm Scope Review"
Share the post "FOV, Exit Pupil, Twilight Factor — Optics Lingo Explained"
With the $329.95 4-16x42mm P5, a Howa Barreled Action, and a Stocky’s Stock, you could put together a really nice varmint rifle for well under a grand! 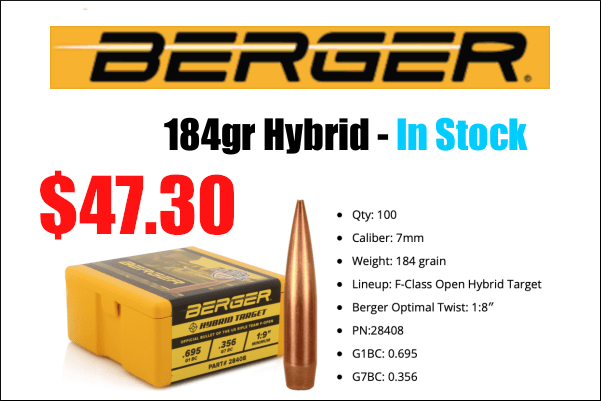 Need an affordable new optic for your hunting or varmint rifle? 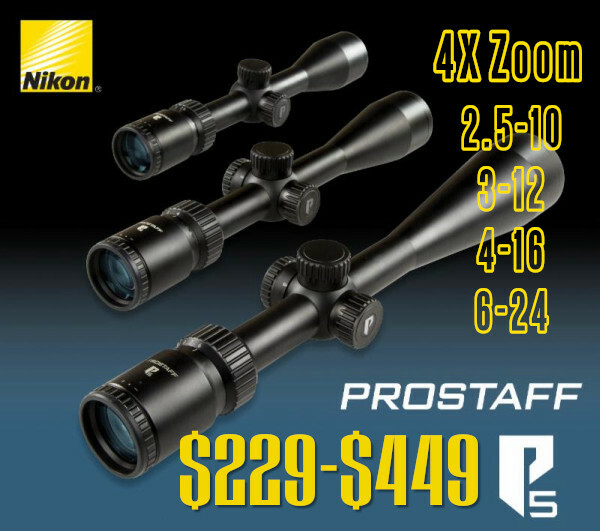 Consider the new Prostaff P5 Series from Nikon. 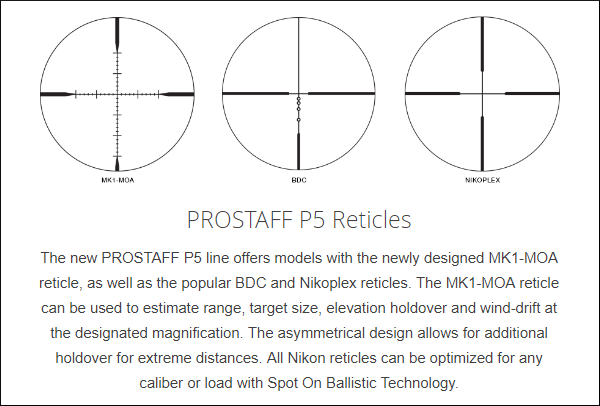 Prostaff P5 scopes all boast a 4X zoom ratio, generous eye relief, and available BDC (bullet drop compensating) reticles. 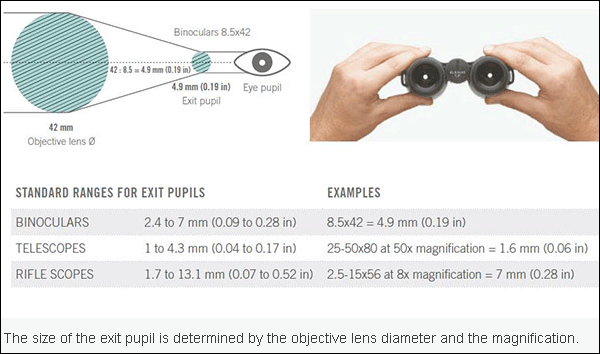 Choose your desired magnification range: 2-10X, 3-12X, 4-16X, or 6-24X. 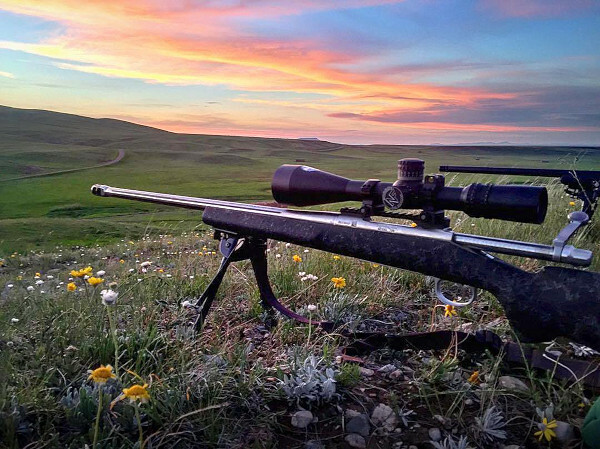 The biggest P5, the 6-24x50mm with BDC, has an MSRP under $450.00, making it a very affordable choice for a side-parallax varmint scope. Being able to zoom all the way from 6X to 24X is handy on a prairie dog safari. 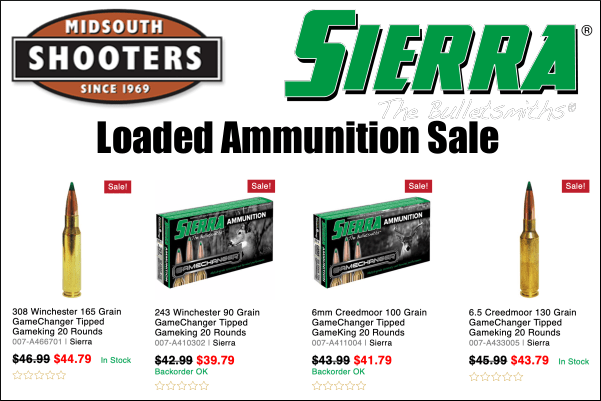 Deer hunters should consider the P5 2.5-10x40mm. 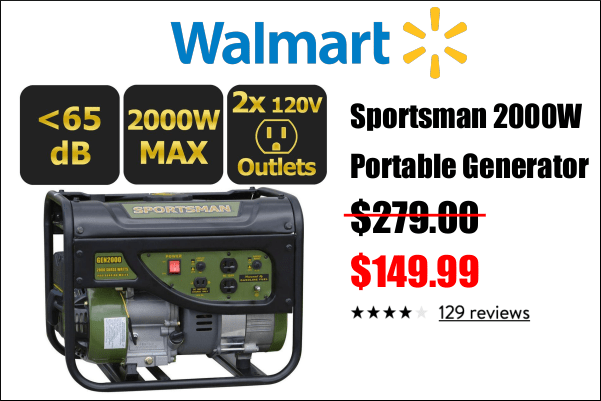 It is just $229.00 MSRP. 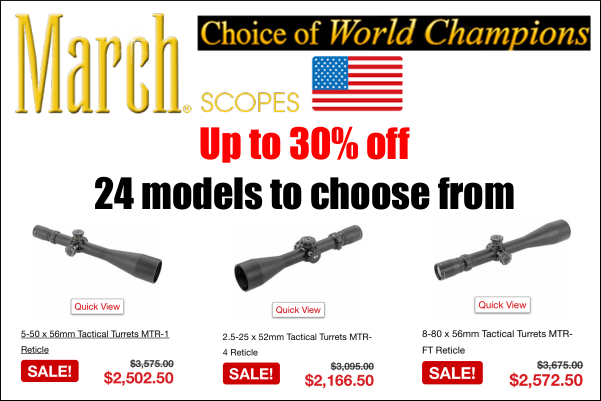 All these scopes come with a great “No Fault” lifetime warranty. Engineered for low mass, PROSTAFF P5s feature all-aluminum zoom ring, plus focusing eyepiece. 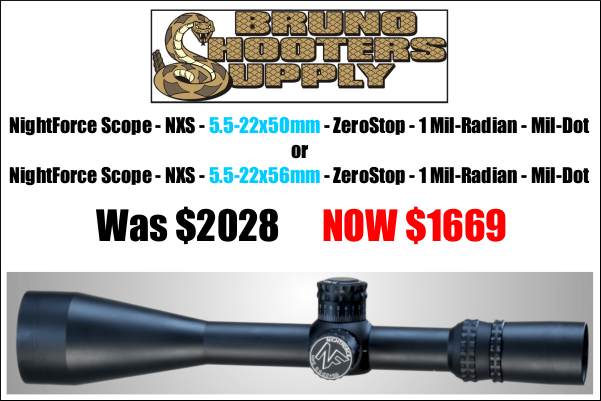 Share the post "Affordable Nikon Scopes for Hunters — Prostaff P5 Series"
Yesterday, April Fools Day, websites offered their best prank stories to readers. 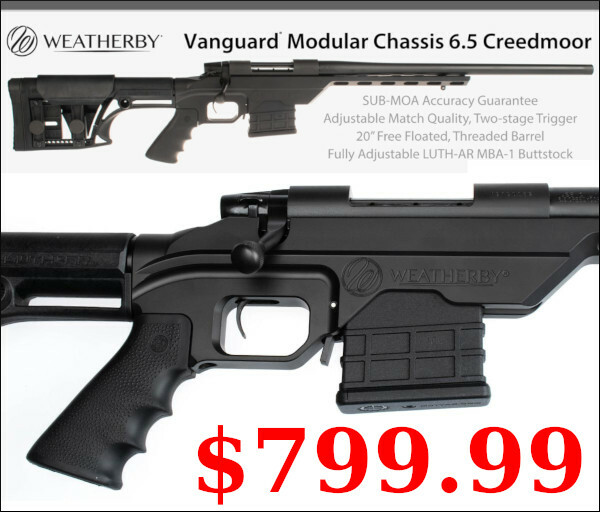 Our own 7.6 Creedmoor satire fooled more than a few folks it seems. 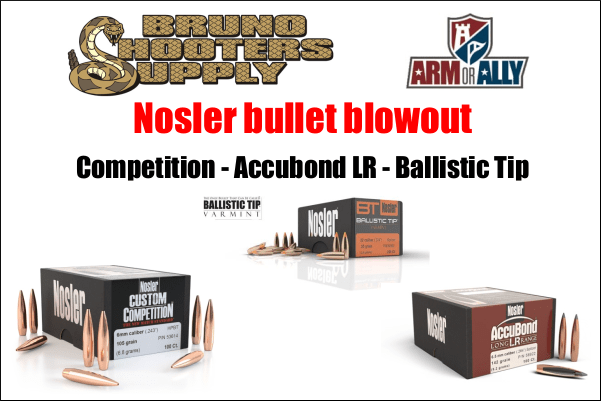 There were some pretty good spoof videos as well, none better than this very funny production from our friends at Vortex Optics. 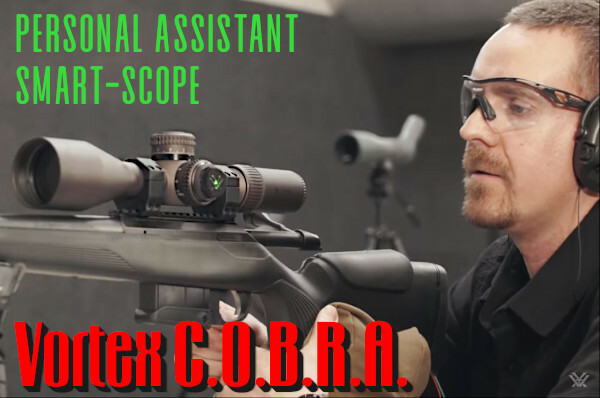 The video showcase Vortex’s new C.O.B.R.A., a state-of-the-art smart-scope with the capabilities of an Alexa-type digital assistant. Watch the video — you’ll see that the clever C.O.B.R.A. has a mind of its own. Enjoy! 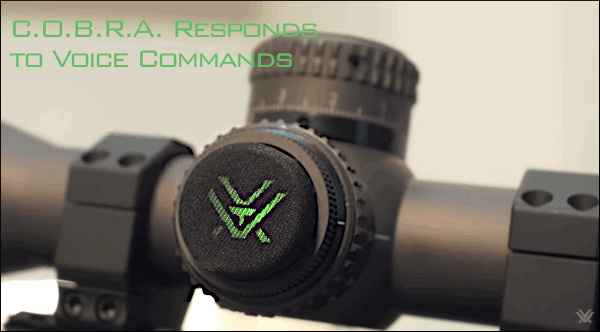 Introducing Vortex C.O.B.R.A., the Combat Optic Battle Ready Assistant, a virtual personal assistant fine-tuned with features specifically for hunters and shooters. 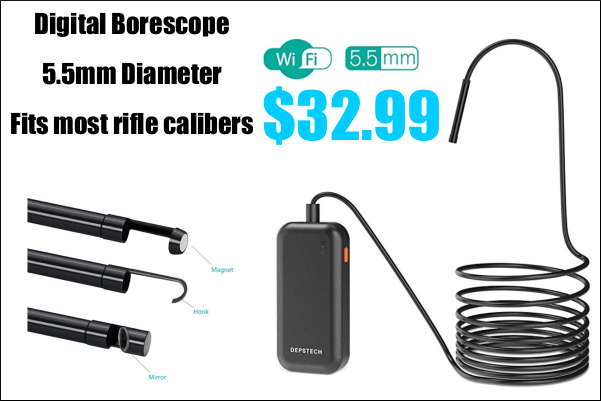 Embedded into select Vortex riflescopes, you can now control your smart-scope with the power of your voice. 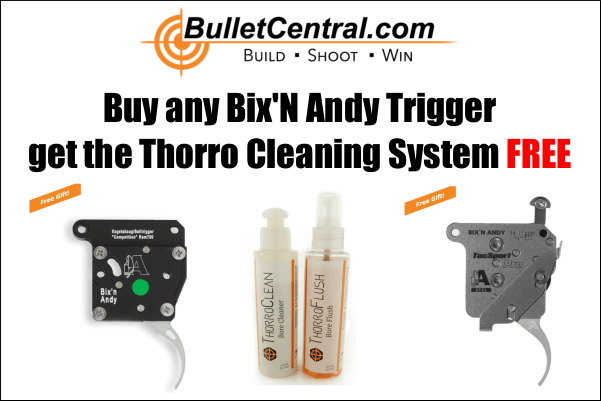 Bore-sighting, dialing turrets, adjusting magnification, and setting your zero stop are just some of the hundreds of tasks that can be accomplished with simple hands free commands. 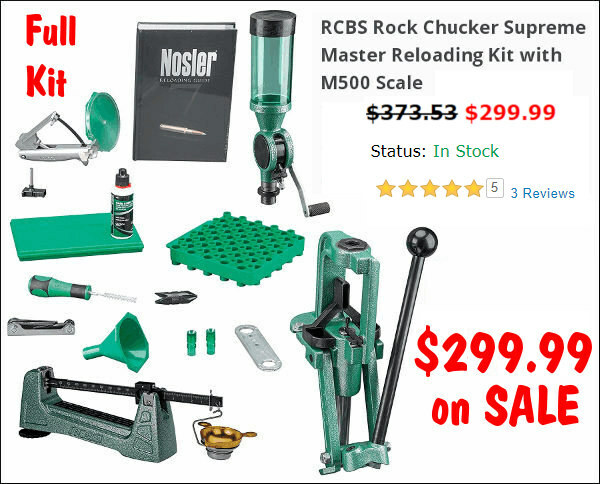 Get C.O.B.R.A, and get your scope working for you! 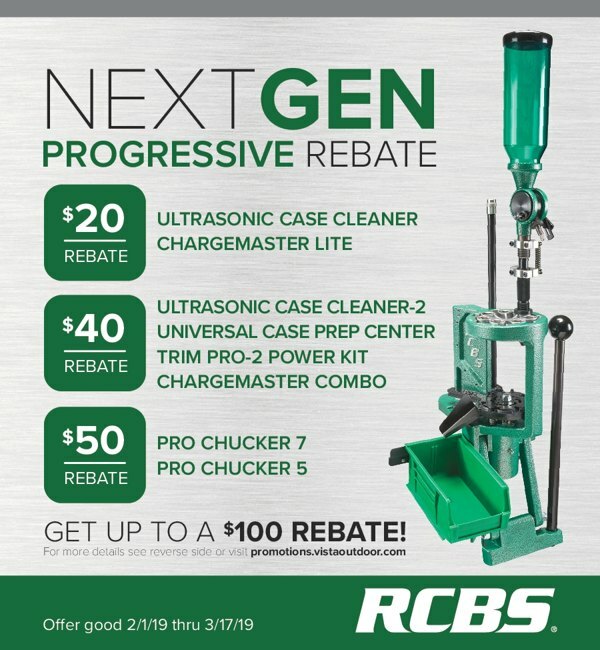 Share the post "Vortex C.O.B.R.A. 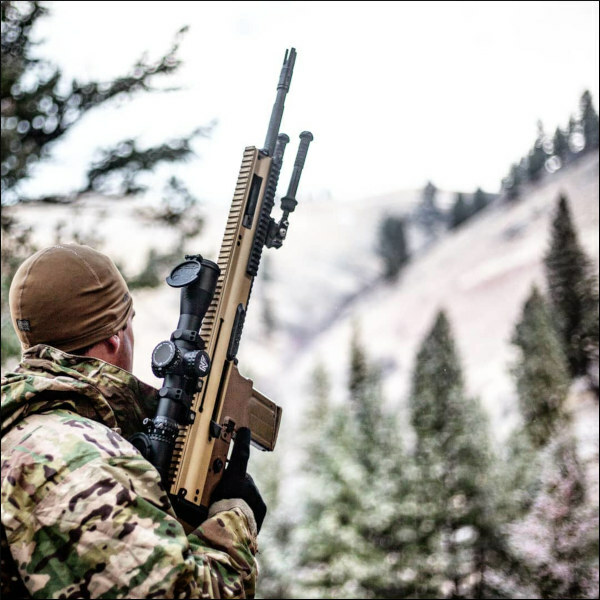 Smart-Scope + Personal Assistant"
Tactacam, builder of compact, waterproof video cameras, now offers a new system, the Tactacam FTS, that allows you to film directly through your rifle scope. 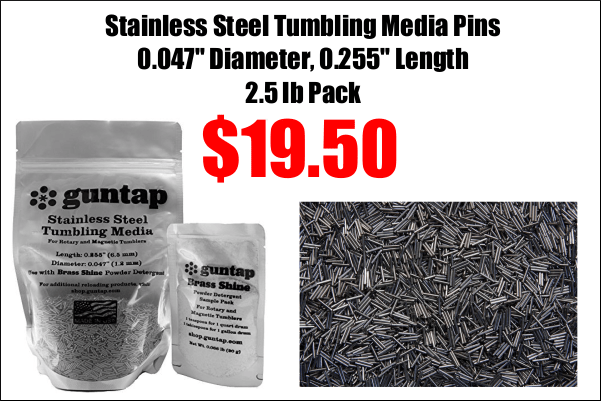 The images you see can be recorded to your mobile device or smart phone as well as viewed live. 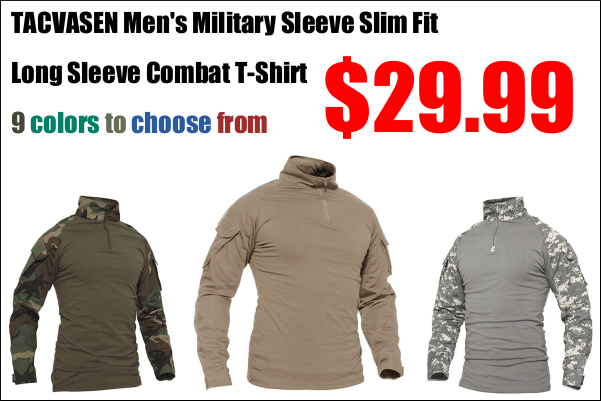 We think this is an important technology for marksmanship training. 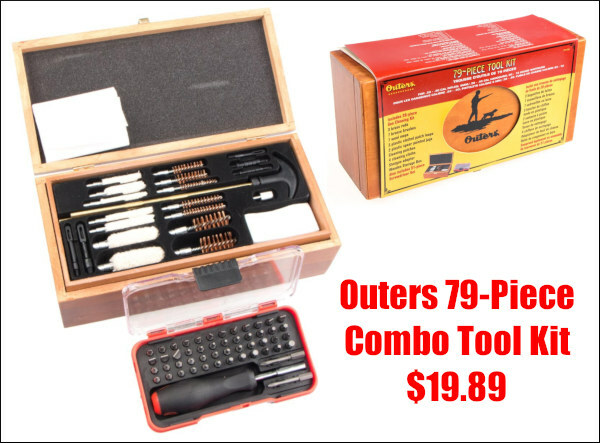 In addition, this is great for hunters who may want to record a successful hunt sequence. 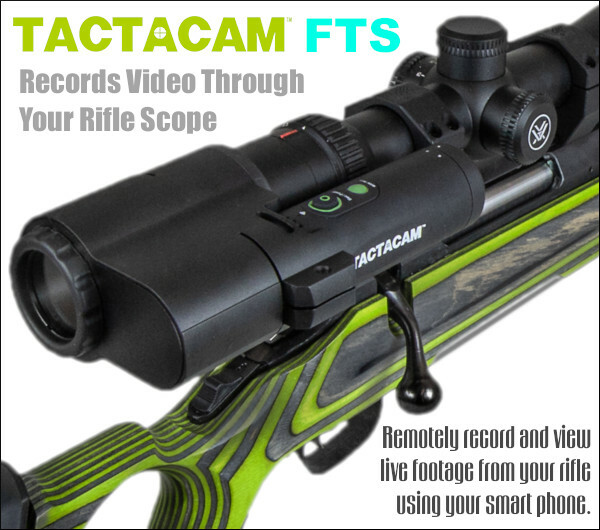 The Tactacam FTS combines the high definition video from your Tactacam camera with the high-power zoom of a rifle scope. 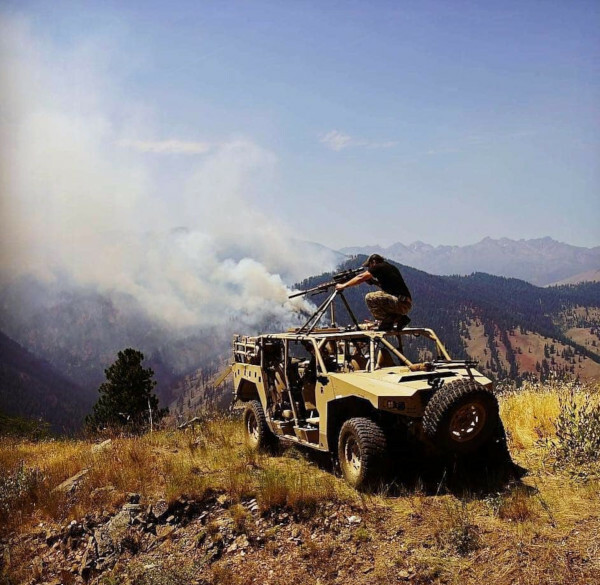 This lets you remotely view and record live footage from your rifle on your smart phone. Simply couple your scope and your camera together with the Tactacam FTS components. Then sync the camera to the Tactacam APP on your smart phone for live viewing. 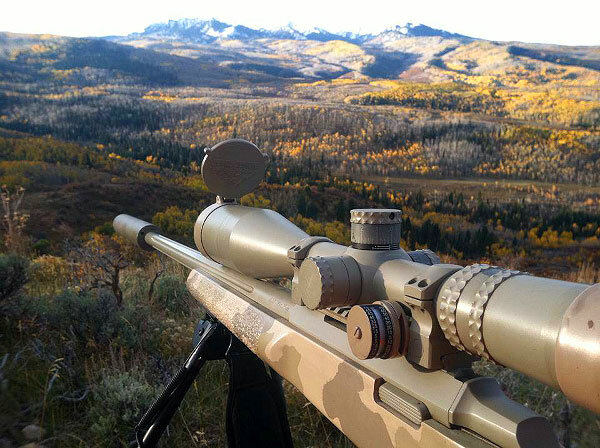 You continue to watch your target through the normal optical axis of the rifle scope. The camera records via the offset FTS camera mount. The output of the FTS camera system can then be viewed, in real time, via a live feed to a smart phone. 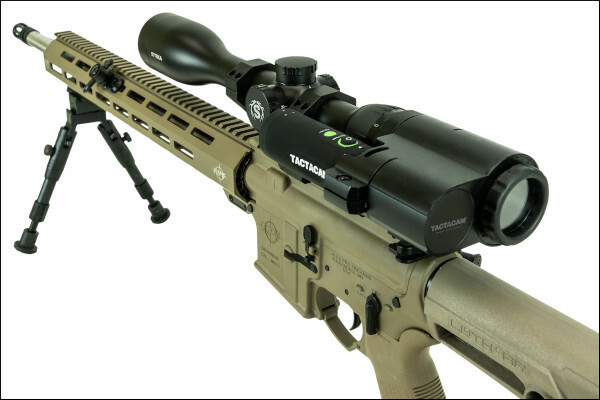 After setup, the Tactacam FTS allows the riflescope to operate as normal without additional adjustment or modification. 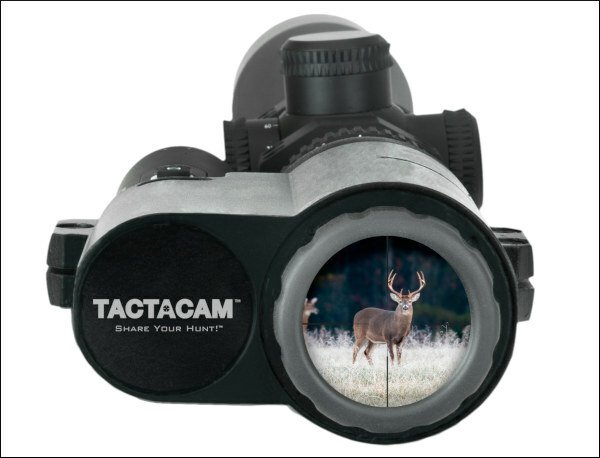 Tactacam’s innovative camera systems allow easy, in-the-field recording of hunts and shooting sessions. 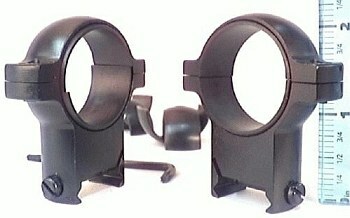 The FTS mount can handle all Tactacam Solo, 3.0, 4.0, and 5.0 cameras. The latest Tactacam 5.0 unit provides 4K resolution with outstanding image quality. 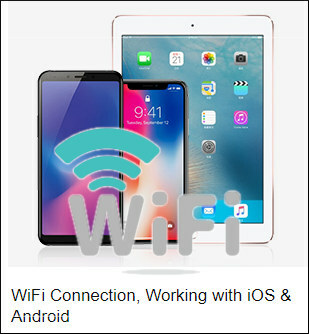 Other features include Wifi and APP viewing options, remote control activation, slow motion, and live-streaming capabilities. The camera output can be viewed both in the App and on external WiFi-capable devices. 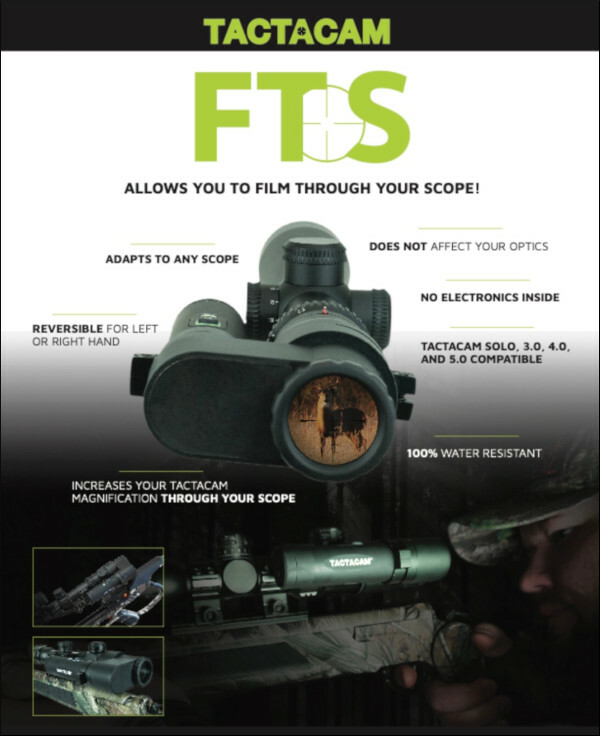 The Tactacam FTS system can attach to nearly any conventional rifle scope. 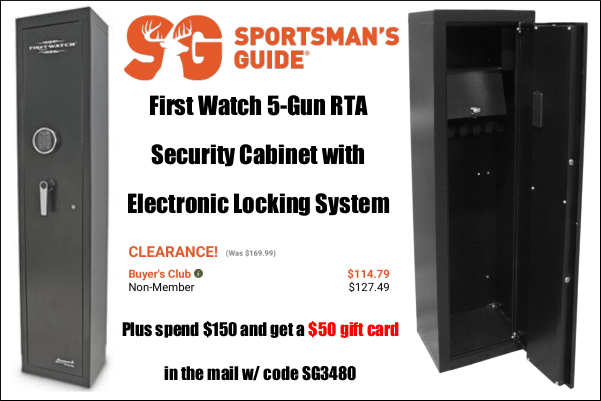 This system is less expensive and easier-to-mount that most other through-the-scope viewing systems. 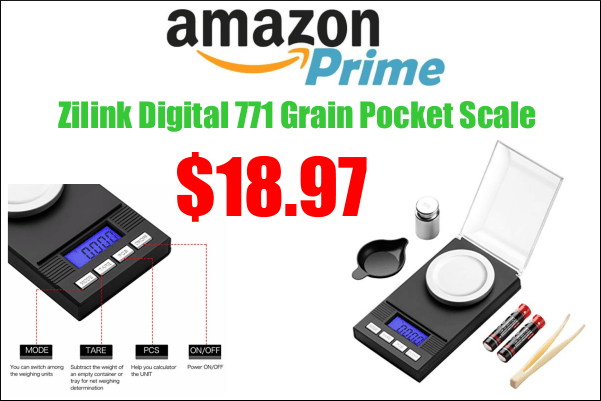 Importantly, your valuable smart-phone remains separate, i.e. NOT attached to the rifle. 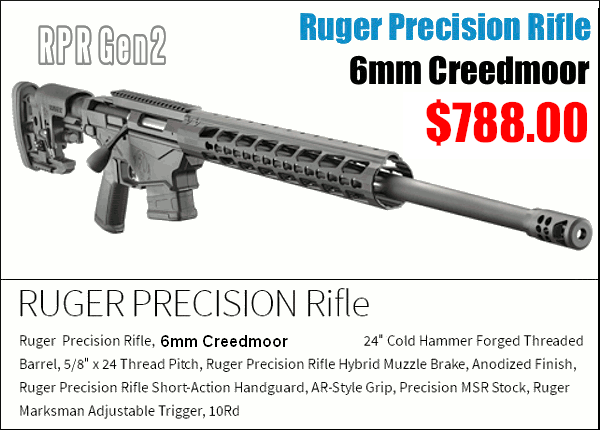 Hence it cannot be harmed by recoil or muzzle blast. 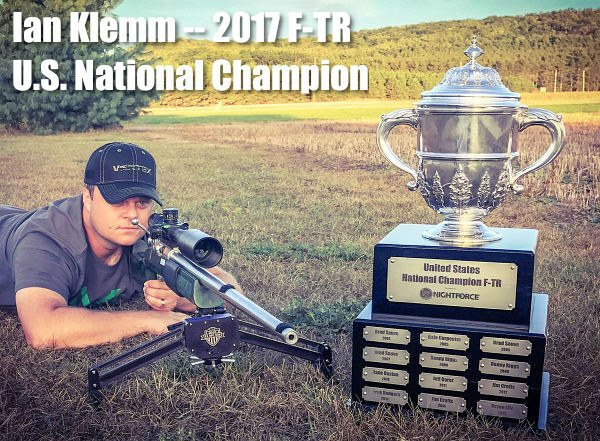 Share the post "Record Video Through Your Rifle Scope with Tactacam FTS"
Today is Super Sunday in Nuremberg. 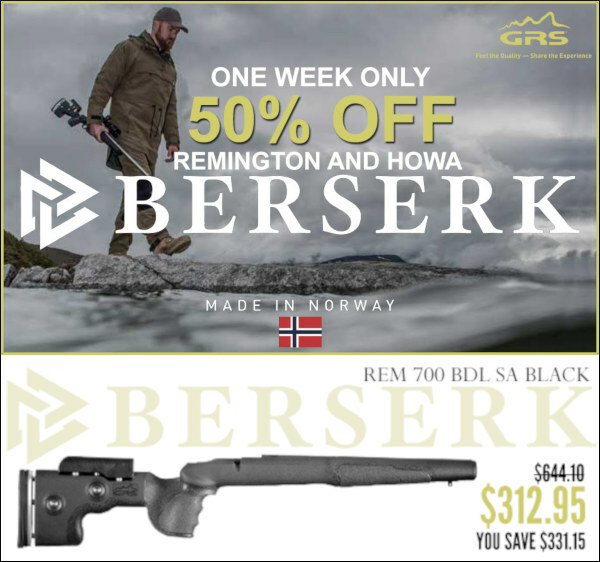 This is the third day of the annual IWA Outdoor Classics trade show, the biggest gun/hunting/outdoor trade show outside the USA. 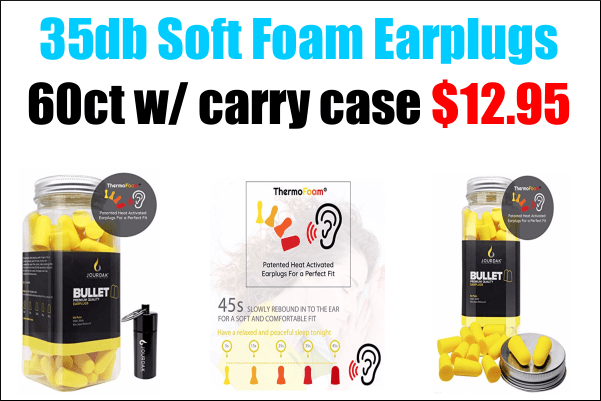 Over 1600 companies are displaying their products. 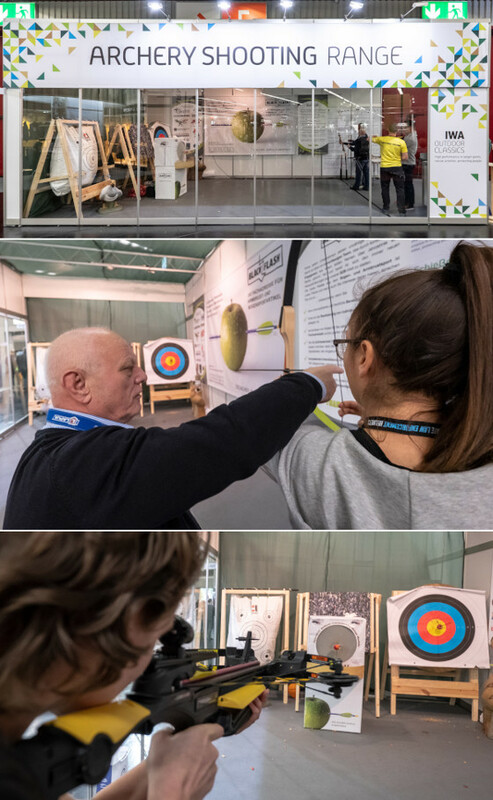 The IWA event, held each spring in Nuremberg, Germany, opened Friday in the Nürnberg Exhibition Centre. The show runs four days, March 8-11, 2019. Here is our IWA Day 3 report, with more images from the show. Photo Credit for IWA images: NuernbergMesse / Frank Boxler and Thomas Geiger, All Rights Reserved. 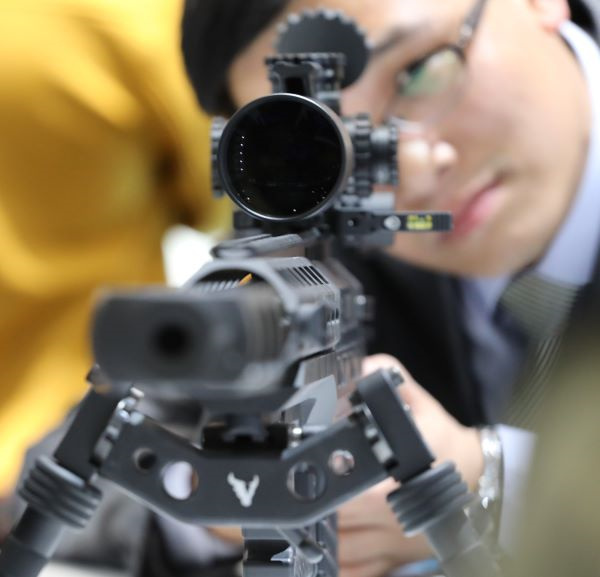 Here a visitor checks out an impressive Minerva-series Tactical Rifle from Victrix Armaments, an Italian rifle-maker affiliated with Beretta. 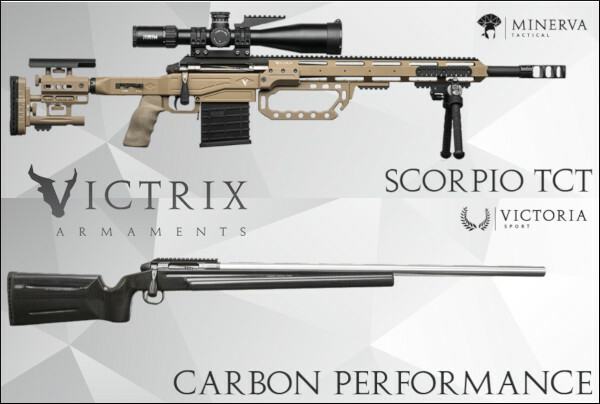 Along with modular tactical rigs, Victrix also makes quality F-Class rifles, prone guns, and hunting rifles. SEE VICTRIX RIFLES HERE. 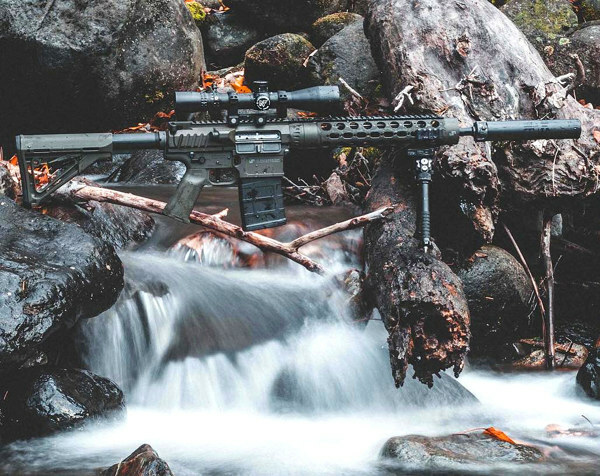 Yes, there were many AR-platform rifles on display at the IWA Outdoor Classics show. 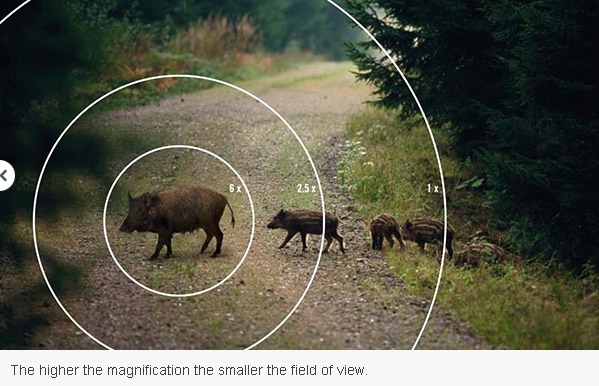 A recent test of the Swarovski dS (see video below) proved this state-of-the-art “smart optic” delivers on its promise — no more dialing knobs. 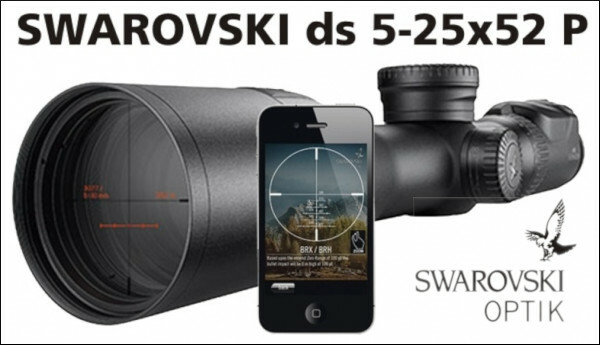 Swarovski’s $4500+ 5-25×52 dS features a built-in laser rangefinder and internal microprocessor. 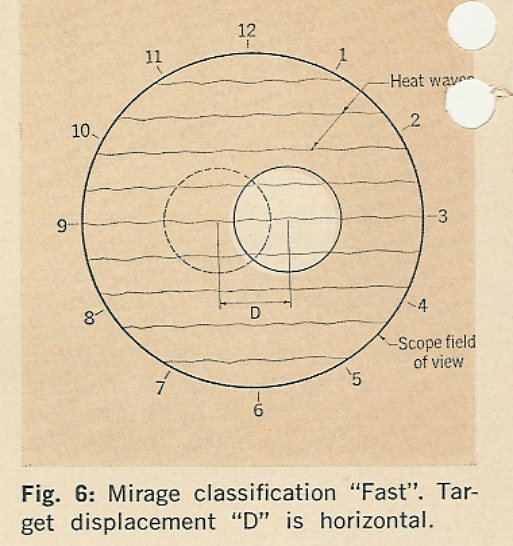 Working with a smartphone App, the Swaro’s sophisticated ballistics computer calculates your trajectory at any distance and then displays an aim point on your reticle. 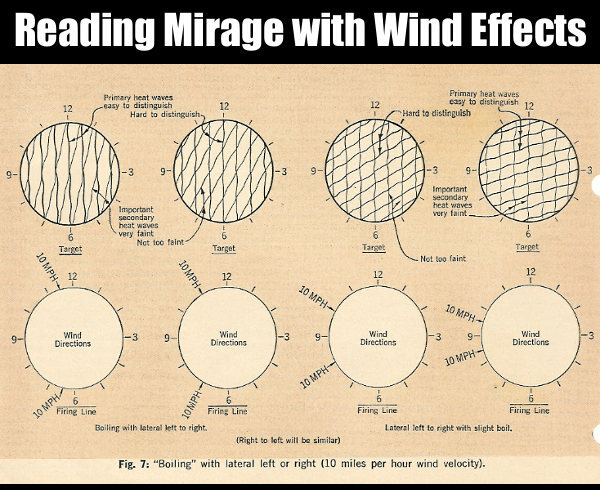 It even adjusts the aim point for the wind (with data entered wirelessly via mobile device). Pride of Pedersoli. 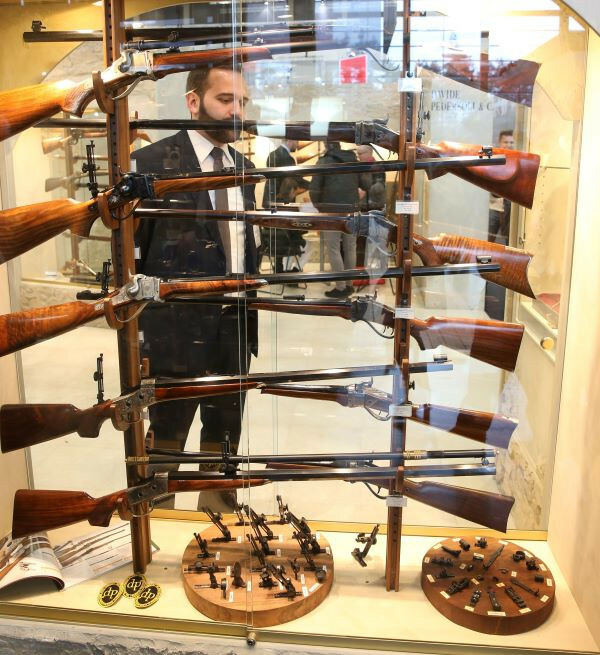 This display showcased handsome Pedersoli side-hammer (Sharps) and falling-block rifles from Italy. Note also the collection of Vernier-type Tang Sights. Bling is the thing. 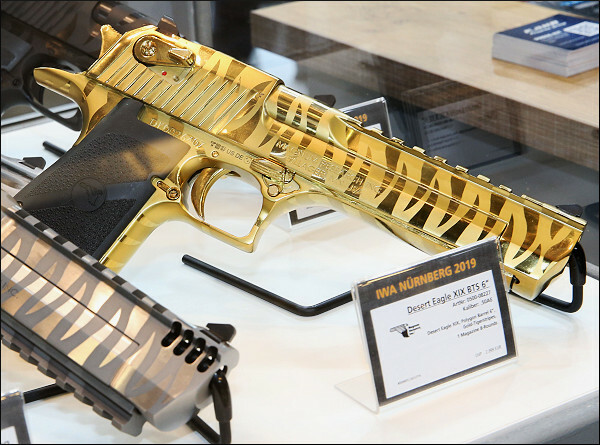 This eye-catching Magnum Research Desert Eagle was at the IWA New Product Center. 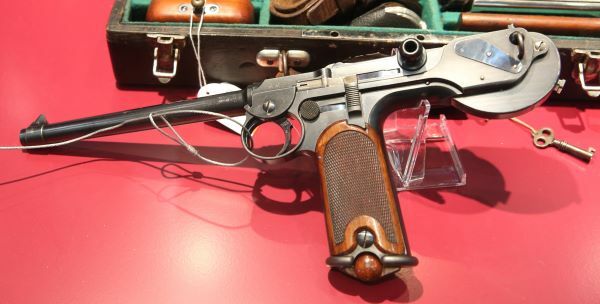 There were also many vintage pistols on display. 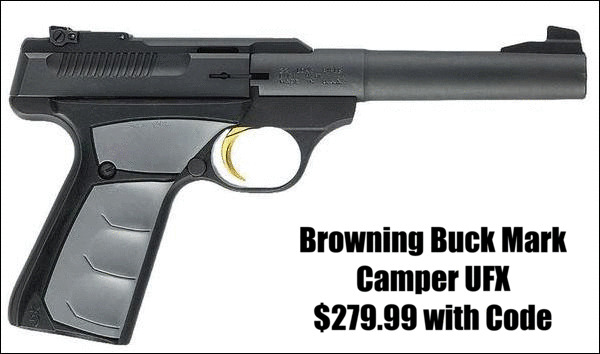 This is an original Borchardt Model 1893 semi-auto handgun, father of the famous 9mm Luger pistol. 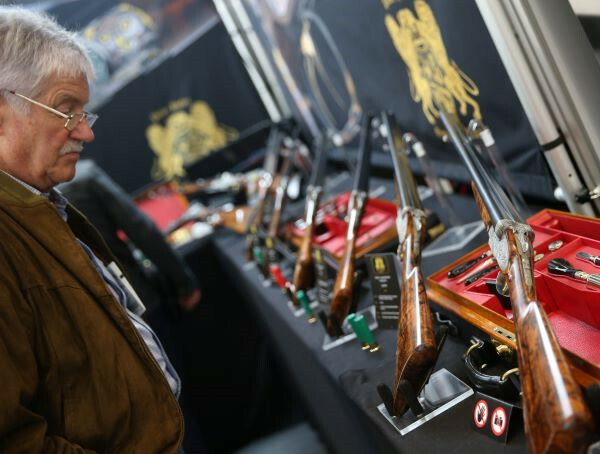 The IWA Outdoor Classics started decades ago as a hunting exhibition, and it still retains that focus. 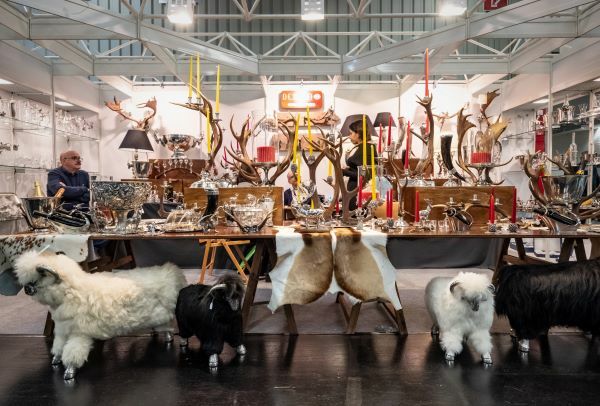 Here is an impressive display of horns and hunting-related items. 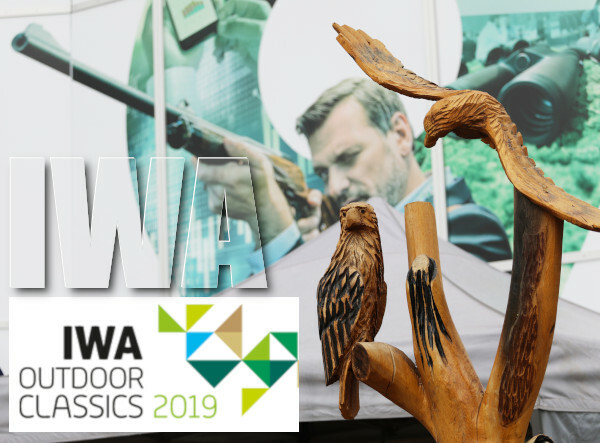 IWA Outdoor Classics visitors could test their archery skills with both conventional bows and with crossbows at the Show’s Archery Center. 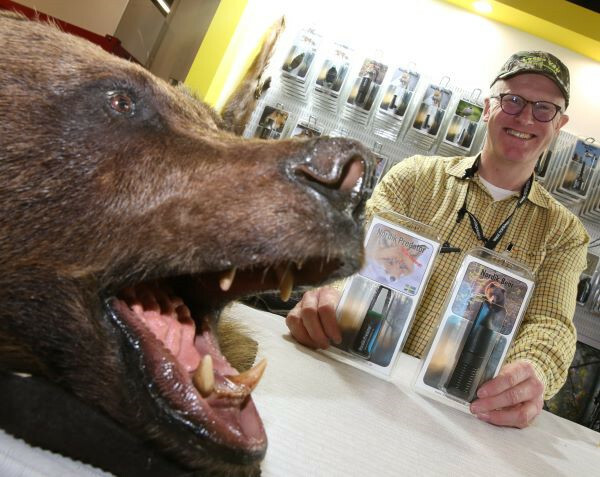 This offered an interesting “hands-on” experience for many show-goers. 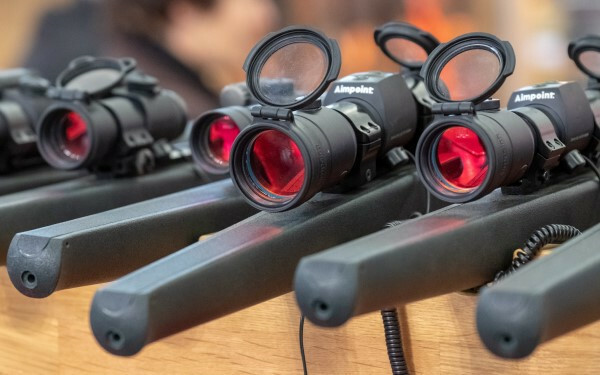 Share the post "IWA 2019 — Guns and Optics Galore in Germany"
Have you recently purchased a new scope? 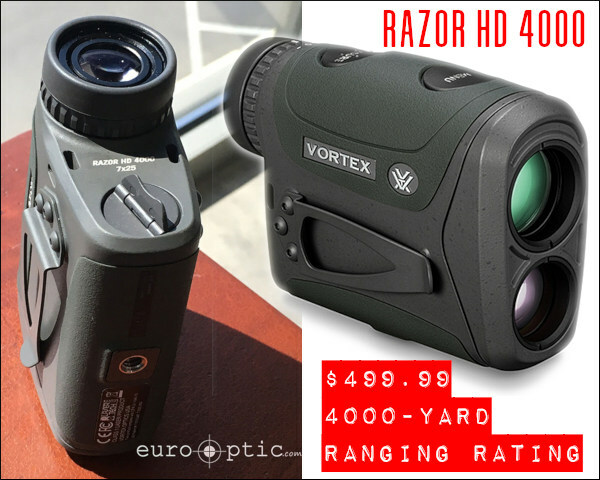 Then you should verify the actual click value of the turrets before you use the optic in competition (or on a long-range hunt). 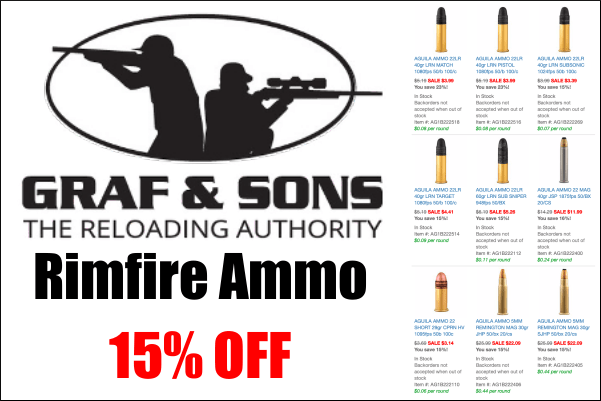 While a scope may have listed click values of 1/4-MOA, 1/8-MOA or 0.1 Mils, the reality may be slightly different. 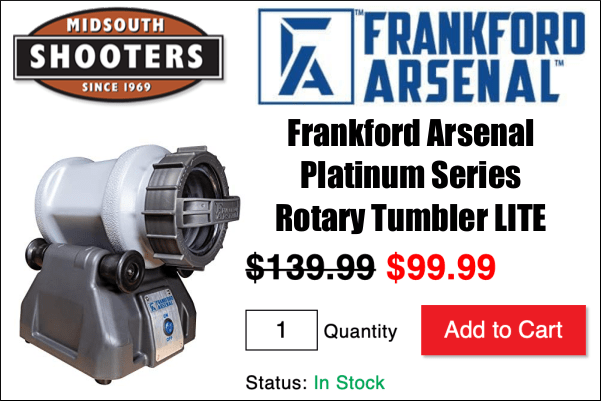 Many scopes have actual click values that are slightly higher or lower than the value claimed by the manufacturer. 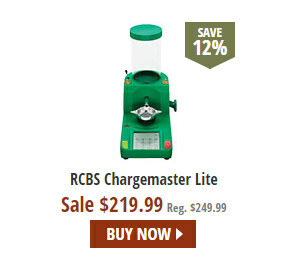 The small variance adds up when you click through a wide range of elevation. 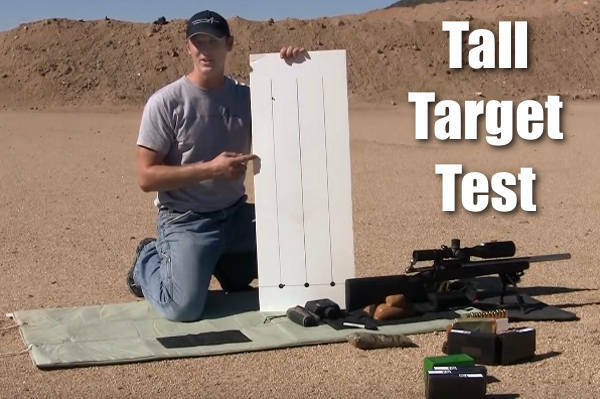 In this video, Bryan Litz of Applied Ballistics shows how to verify your true click values using a “Tall Target Test”. The idea is to start at the bottom end of a vertical line, and then click up 30 MOA or so. 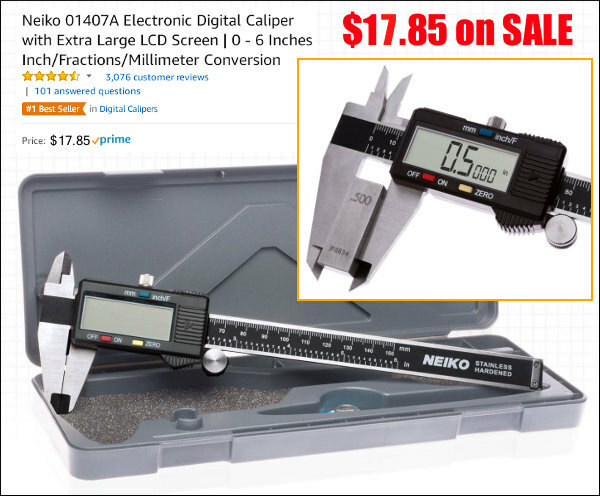 Multiply the number of clicked MOA by 1.047 to get the claimed value in inches. 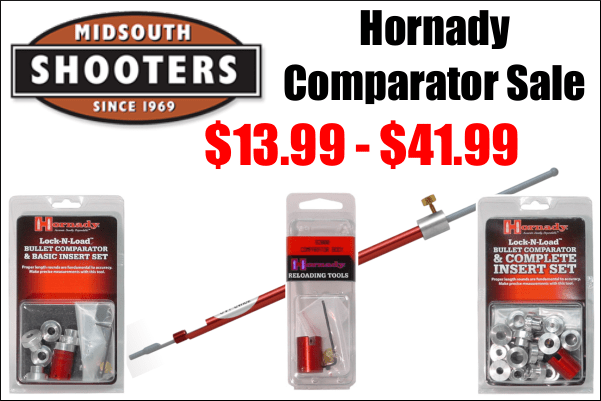 For example, at 100 yards, 30 MOA is exactly 31.41 inches. Then measure the difference in your actual point of impact. 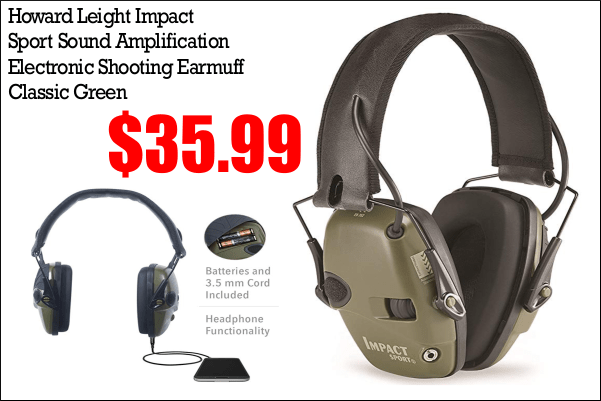 If, for example, your point of impact is 33 inches, then you are getting more than the stated MOA with each click (assuming the target is positioned at exactly 100 yards). 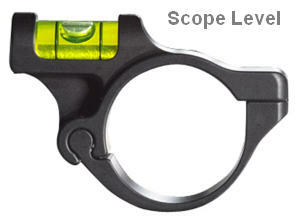 The objective of the tall target test is to insure that your scope is giving you the proper amount of adjustment. 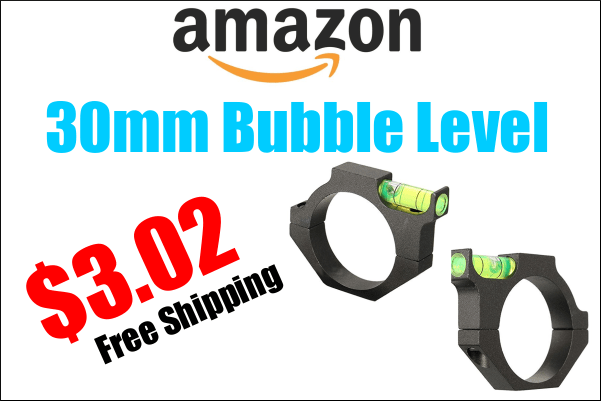 For example, when you dial 30 MOA, are you really getting 30 MOA, or are you getting 28.5 or 31.2 MOA? The only way to be sure is to verify, don’t take it for granted! 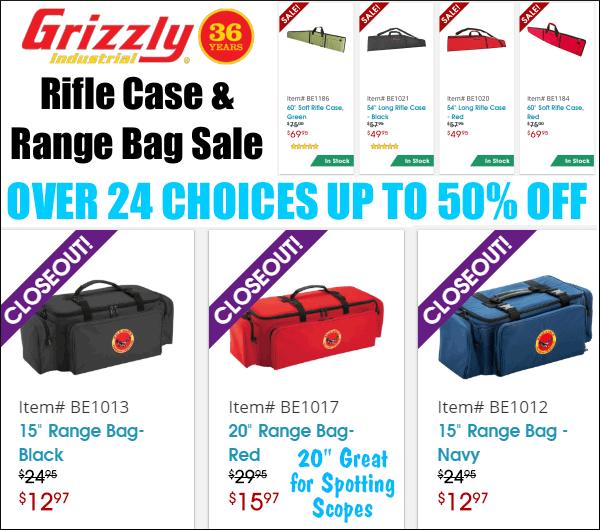 Knowing your scopes true click values insures that you can accurately apply a ballistic solution. 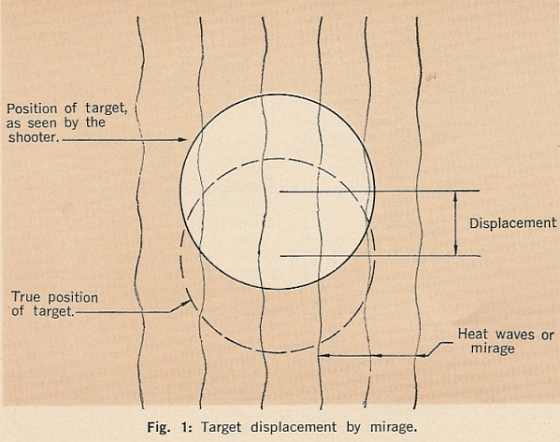 In fact, many perceived inaccuracies of long range ballistics solutions are actually caused by the scopes not applying the intended adjustment. 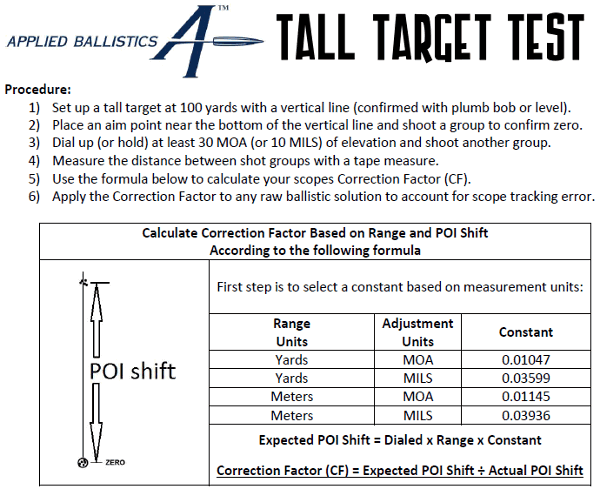 In order to verify your scope’s true movement and calculate a correction factor, follow the steps in the Tall Target Worksheet. 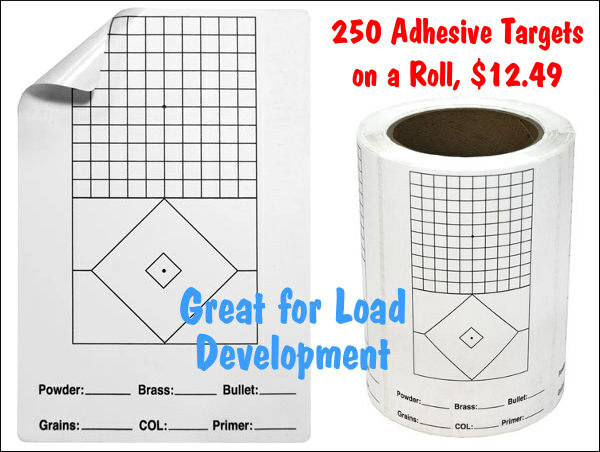 This worksheet takes you thru the ‘calibration process’ including measuring true range to target and actual POI shift for a given scope adjustment. 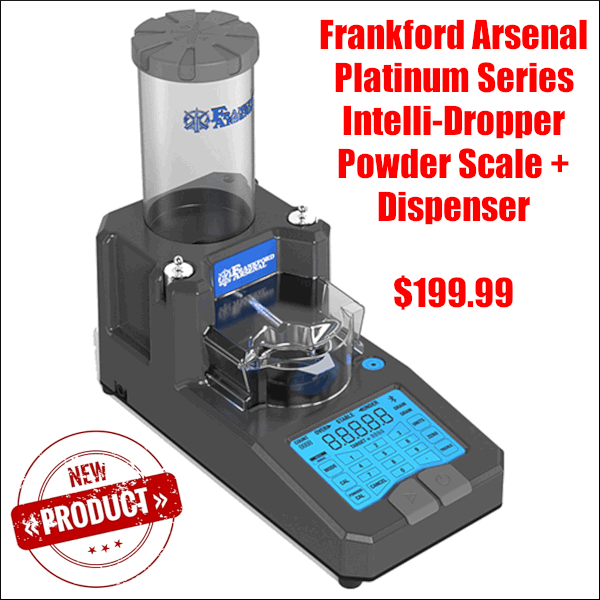 The goal is to calculate a correction factor that you can apply to a ballistic solution which accounts for the tracking error of your scope. 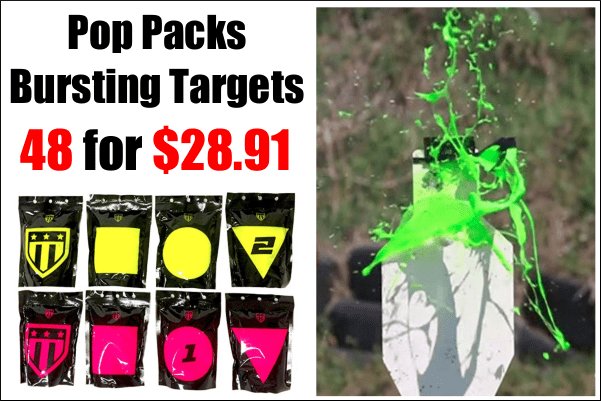 For example, if you find your scope moves 7% more than it should, then you have to apply 7% less than the ballistic solution calls for to hit your target. 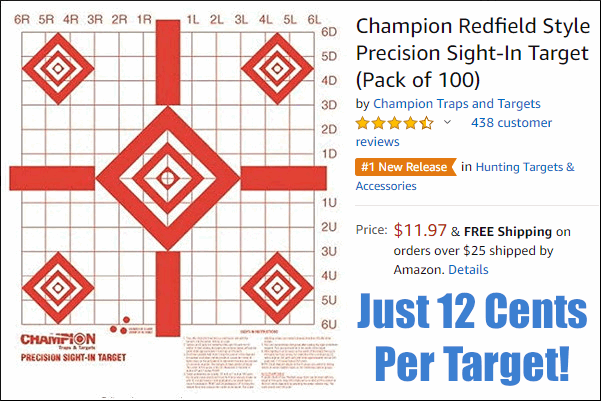 Should You Perform a WIDE Target Test Too? NOTE: For ‘known-distance’ competition, this is the only mandatory part of the tall target test, since slight variations in elevation click-values are not that important once you’re centered “on target” at a known distance. 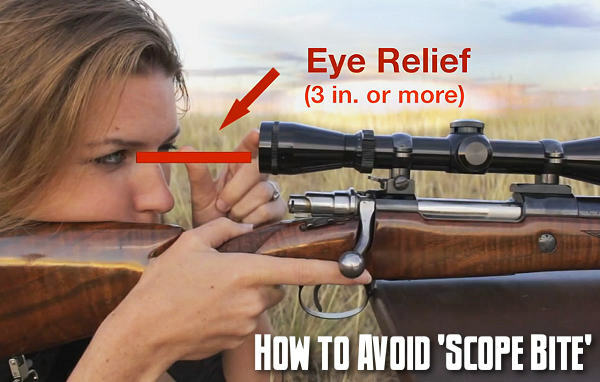 Share the post "Tall Target Test — How to Verify Your Scope’s True Click Values"
Kirsten offers a good basic principle — she suggests that you mount your rifle-scope so that the ocular (eyepiece) of the scope is positioned at least three inches or more from your eyeball when you hold the rifle in your normal shooting position. 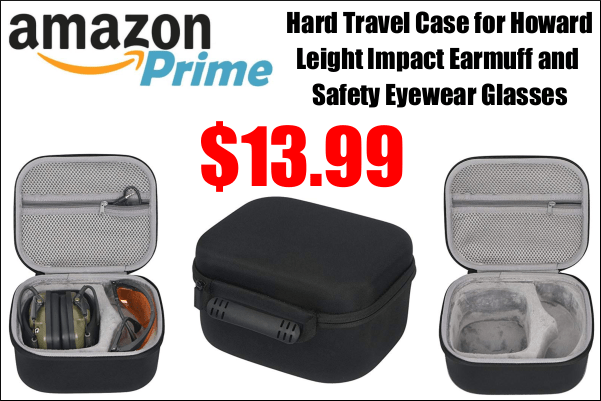 From a technical standpoint, optical eye relief is a property of the scope, so you want to purchase an optic that offers sufficient optical eye relief (meaning that it allows you to see the full circle of light with your head at least three inches from the eyepiece). 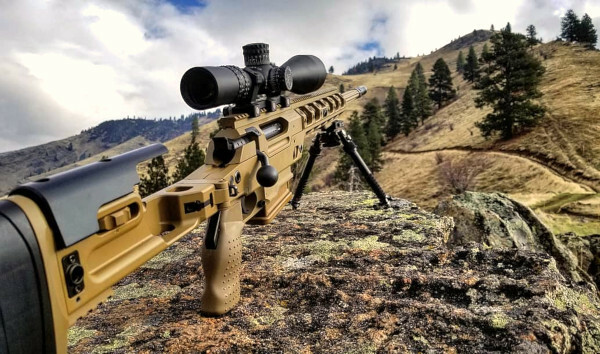 Then you need to position the optic optimally for your head/eye position when shooting the rifle — with at least three inches of eyeball-to-scope separation (i.e. physical eye relief). NOTE: You should mount the scope to provide adequate eyeball-to-scope separation for the actual position(s) you will be shooting most of the time. 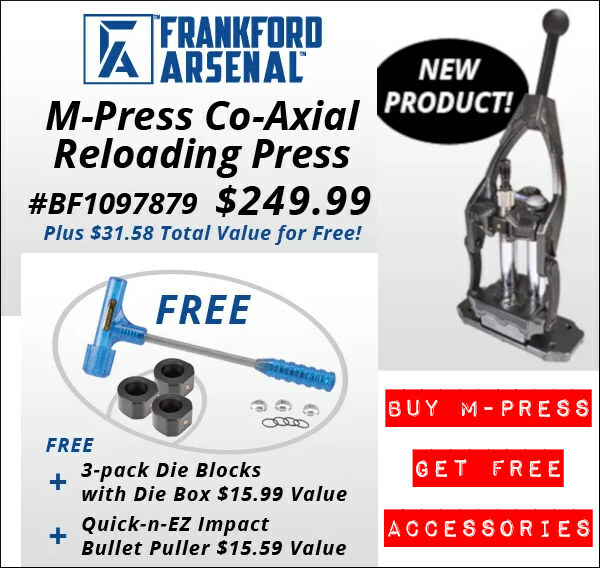 For an F-TR rig, this will be prone. 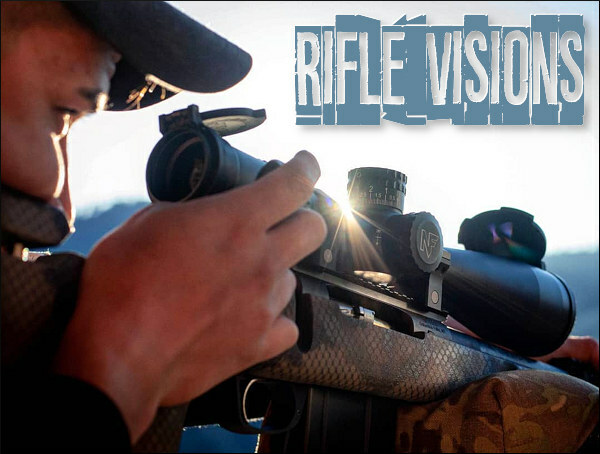 For a hunting rifle, your most common position could be sitting or standing. Your head position will vary based on the position. 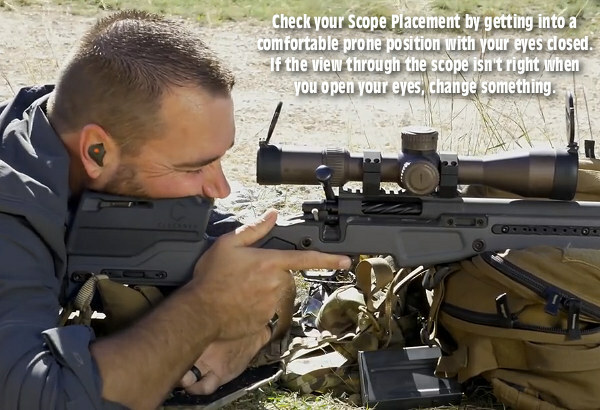 You can’t assume the scope placement is correct just because it seems OK when you are testing or zeroing the gun from the bench. When shooting from a prone or kneeling position you may find your eye considerably closer to the eyepiece. 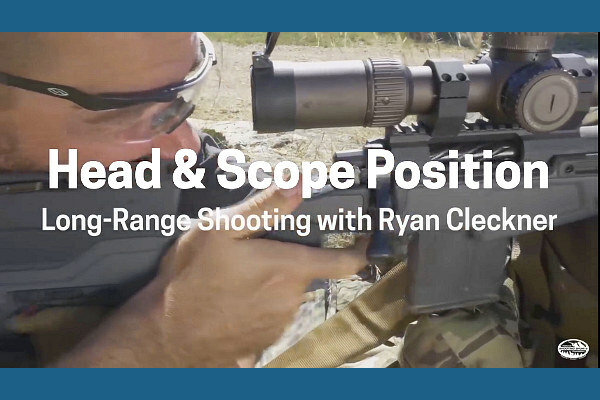 Share the post "Scope Mounting — How to Avoid That Rude Poke in the Eye"